The third edition of the Fluence Analytics Technical Bulletin Series includes an ACOMP case history and a technical note on using ARGEN to analyze the impact of stirring stress. During the fracking boom there was high demand for a number of enhanced oil recovery chemicals, and many manufacturers sought ways to increase capacity with existing assets. In 2014 Nalco, an Ecolab Company, innovatively partnered with Fluence Analytics to pioneer the use of industrial ACOMP in one of its manufacturing facilities, subsequently leveraging ACOMP data to reduce batch cycle times. Click here to read a full case history on ACOMP’s performance in this application. This note details the simplicity in which ACOMP monitors and analyzes the free radical polymerization of 2-ethylhexyl acrylate and acrylic acid. This application note also compares the realtime data generated by ACOMP to GPC results which is the industry standard for characterization. Read the full application note here. Fluence Analytics latest technical article was published in the August 2018 issue of PCI Magazine (Paint & Coatings Industry). The article discusses the third-generation ACOMP and how it easily monitored and characterized the free radical solution polymerization of methyl methacrylate. This technical note discusses how ARGEN can examine mechanical and physical stress beyond contact stirring. 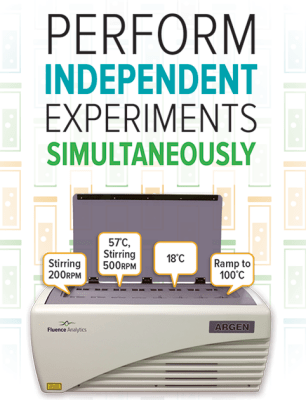 Since ARGEN has 16 independent sample cells with fixed optical pathways, researchers can easily tailor experiments to match desired conditions. 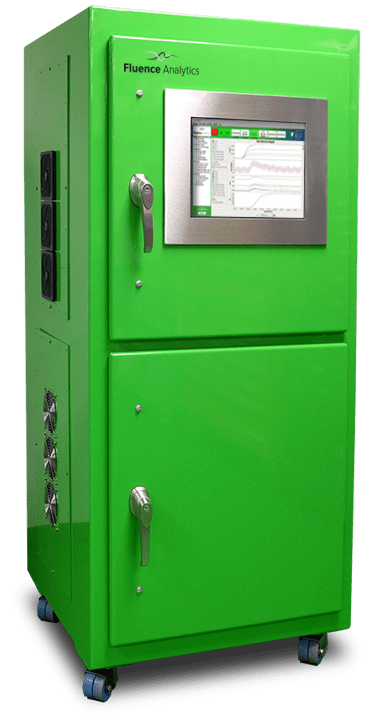 Using basic lab equipment such as pumps, tubing and filters, researchers can construct systems capable of probing the desired stress using ARGEN. ARGEN demonstrates the rapid formulation of four peptides based on excipient effects correlated to increasing molecular weight. The first peptide was formulated in five days for optimal stability. The remaining three peptides were formulated in parallel over 10 days. Read the full application note here. In this study, ARGEN is used to analyze spoilage which caused increases in molecular weight due to aggregation or association. Specifically, this application note discusses measures of stability, Time to Dimer, and Time to Tetramer. Read the full application note here.